Our full-bodied Italian Roast is robust and intense delivering spicy characteristics with a long finish typical of coffee from southern Italy. This coffee is a perfect representation of Tully’s roasting philosophy. Slow roasting at a low temperature allows this coffee’s complexity to be unwrapped with each sip. A malty sweetness plays with smoky elements that help develop the full bodied cup. Creamy and rich in the mouthful, the finish offers burnt cedar yet is pleasantly dry. Roasty aroma with mild smoky, earthy and caramel-like notes. Full, silky body, simple flavors of charred wood and fresh tobacco. Dry roasty note in finish, with some astringency that fades and rounds in the long. Some professionals need to approach their jobs slowly and with a great deal of care. Like tightrope walkers. Or brain surgeons. Or tattoo artists. 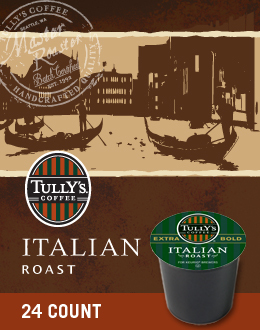 At Tully’s®, the same holds true for creating great coffee. It takes a lot of time and patience, which is why we slow roast our coffee beans to gently coax out the complex flavors and aromas. With roots in the Pacific Northwest, where coffee is a way of life, we take our time in roasting and in training each master roaster in our artisanal approach. From the aroma to the full-bodied flavor, you can taste the time taken in every satisfying cup of Tully’s. Now we invite you to take your time discovering it.